A 12-year-old boy guards a great gift. “Don’t you mess with my Bible,” the boy’s look seemed to say. Las personas sordo mudas no entienden las cosas desde la perspectiva de una persona oyente. Cientos de lenguajes de señas alrededor del mundo no tienen la Palabra de Dios. Vea cómo la Biblia cobra vida para las personas sordo mudas en El Salvador cuando es traducida a su lengua por primera vez. Like many Quechua-speaking women, Marcelina wasn’t able to go to school when she was a child because she had to work. But Marcelina’s life was forever changed when she first attended literacy classes and learned how to read and write in her own language as an adult. Martha Matzke shares how a grandmother and wife of the pastor of the local church learned how to read for the first time when literacy classes were offered in their language. The woman was able to stand up in front of her congregation and read Scripture aloud in her own language for the very first time. President Bob Creson and Johnnie Moore celebrate a New Testament translation with the Eastern Apurímac Quechua people of Peru. Bob discusses how exciting it is that the Eastern Apurímac Quechua people are now able to access God’s Word in the language that they love and dream in. When people have the Bible, they feel a sense of hope and confidence, especially when others have viewed their language as worthless or their culture as something that needs to be changed. Translating the Bible into minority languages lets people know that they matter to God and that he speaks their language, too. Minority language speakers in Kenya experience the truth of God's Word when they stop trying to understand Scripture in other languages and start studying it in the language they understand best. Now they see that there is a big difference between understanding God’s Word and comprehending it. President and CEO of Wycliffe Bible Translators, Bob Creson, and Johnnie Moore celebrate a New Testament translation with the Eastern Apurímac Quechua people of Peru. Bob discusses how exciting it is that the Eastern Apurímac Quechua people are now able to access God’s Word in the language that they love and dream in. When Mario Valverde moved to Abancay, Peru, his goal was to pastor a small Quechua church. At the time, the congregation only numbered 13, but the people had a deep passion for God and a desire for the Bible in their own language. Valverde brought in Quechua-speaking pastors rather than Spanish-speaking ones and the congregation responded well. 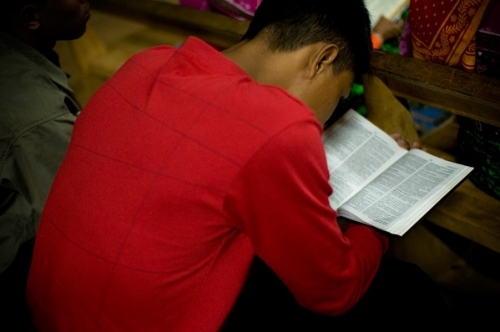 Soon more pastors in the area with growing churches were vocalizing their desire for Scripture in their own language, too. That passion from the local church in Peru led to a partnership with Wycliffe, in hopes of translating the Bible into Eastern Apurímac Quechua.